But if your spoons are anything like the ones in our house - they multiply - very quickly!! Well, I've taken up an experiment for the past week and a half. I've always struggled with keeping the kitchen clean. It is especially difficult cleaning up after dinner because I am generally tired at the end of the day and I want to relax! One day, Andrew gave me some advice (in a nice way, of course!). You see, his parents' kitchen is always clean! It's like magic! And I know his mom does a lot of cooking, so it should be getting dirty, right? He said that growing up, his parents always cleaned dishes immediately and if any dish could go in the dishwasher, you put it there right away - no time hanging out in the sink! I put that advice on the back-burner for awhile - after all, surely that would not work for me. I've never been the clean-as-I-go type. But in the flurry of nesting mode, I decided to give it a go... By golly, it works! The kitchen has been clean for pretty much the last week and a half! Sometimes a few things pile up, especially when I am in the middle of cooking or baking, but I always make sure to clean it up as soon as I can. 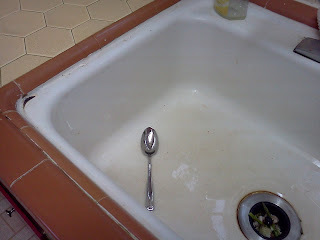 I don't even let one spoon hang out in the sink because that, my friends, is the beginning of the slippery slope. It's also nice not having to scrape dried food off dishes - who knew it rinses right off if you clean it immediately! Andrew has even commented that when the kitchen is perfectly clean he feels bad leaving one dish out, so he is also motivated to clean up immediately after himself. Whereas, before if there were already dishes collecting in the sink, what's wrong with adding a few more? I know I'll have down days, and everything won't always be perfect, but I am really hopeful right now that I'm developing good kitchen habits that are here to stay. My favorite part about having a clean kitchen is I feel like I have more time to do other things - like play with John and keep up with the rest of the house. This morning was rough. John use to stay in his bed and yell, "Open door please, Mama!" Until I relented and rolled myself out of bed to open his door. I think he did this because he was afraid to get out of bed. Well now we have entered a new phase of independence. I even tried to open his door once this week and he told me to "let Johnny do it." With this new independence also comes earlier wake up calls because he gets up the instant he is awake. Yesterday he was bright and chipper at 6:15am and today he let me sleep in until 7:15am. I'm generally accustomed to sleeping in until 8am - spoiled, I know! But this morning he was up and not so chipper. I told him that I would send him back to bed if he was going to be so crabby. Once we got to the living room and started playing with toys he was better. But I was still finding myself annoyed by little things. I was making sandwich bread and he wanted to help put the salt in. I let him do it, but tried to guide his hand. He wanted to do it on his own and sure enough - he dumped the salt on the counter right next to the mixing bowl. I know it's not big deal, but I've noticed he wants to be independent when he really still needs help, and dependent when he doesn't really need help (i.e. wanting me to pick up his toys for him). Anyway, I was feeling very negative with all these little things. But once the bread was in the oven and the kitchen was clean, I went into the living room to be with my little guy. I really do love him. He has such a great imagination - acting out voices for his stuffed animals and little figurines. He also loves to read. He could be read to all day if I was willing. His bookshelf is in constant disarray because he is always pulling books out to read. Today he found a book by Peter Yarrow that is full of lullaby lyrics and beautiful pictures. Attached to the inside cover is a CD with all the songs. We got it as a baby shower gift before John was born and we've never listened to the CD. I asked John if he wanted to listen to it with me. He said yes. So we busted it out of it's untouched case and put it in the CD player. It was a great album. I really like Peter Yarrow's voice. We sat on the couch and I sang along with the songs. John was surprised too. He is always so concerned when I cry. "Cuddle Mama," he said as he came over and hugged me. It's so easy to get caught up in the day-to-day. Picking up toys constantly, repeating yourself over and over, dealing with crabbiness, picky eating, being pulled out of bed at who-knows-what-hour... I instantly felt so bad for feeling irritated earlier. My little boy will not be little forever. This precious time I have with him is so fleeting and I resolve to value it more. Who knew good ol' Puff would bring me to my senses... for today. They definitely did the job! But I recently envisioned a new wipe that was more heavy duty, because sometimes you just need a little more than flannel. So I made some new wipes that are the best of both worlds - one side is terry cloth (for the dirty work) and the other is flannel (for a smooth finish!). I started using the new wipes with John and I really like them. I am usually able to do a big job with only one wipe. I made a set of 20 wipes so that should be plenty. I still use the same spray bottle solution to get the wipe nice and moist before using it. We have been cloth diapering for over two years now. If you've been around our blog that long, you'll know that we settled on Fuzzi Bunz. They are "One-Sized" meaning they are designed to last from birth to potty training. Smell - After the diapers are cleaned, they smell pretty neutral. I have noticed that once John goes pee the diapers smell like ammonia sometimes. After looking into this problem, I discovered that it is probably caused by soap build-up. This can be solved by "stripping" the diapers. I don't do this on a regular enough basis to know if it would really work. I have stripped the diapers and it does seem to help, but I generally just try to keep him in a dry diaper and deal with the stinking factor. Repelling - Sometimes the diapers have repelled pee. For example, more than once the diapers have leaked and they weren't even wet! Again, this problem was solved with a good stripping. Rash - About a year ago, John had a terrible rash. His skin was raw and welted to the point that cream would not stick to it. He had it for weeks and I was trying everything to get rid of it. We had to switch to disposables during this time because I didn't want to damage the cloth by using various creams that we were trying (you must use special creams on cloth diapering that won't build up on the fabric, which can cause more repelling). I believe the rash was caused by his "all night diaper" as we called it, which was a Fuzzi Bunz diaper with two absorbing inserts inside... let's just say he had a fluffy bum at night! His bottom just couldn't handle being exposed to all that moisture during the night and the diaper wasn't good at pulling the moisture away from his skin. I sought advice from many friends. One told me I should try athletes foot cream because it has an anti-fungal properties. She told me the key ingredient was Clotrimazole. I was willing to try anything, so we went and bought a tube of athlete's foot cream. It worked!! Within three days, the rash was pretty much gone. Two results came from that experience: 1. We keep athlete's foot cream in our diaper supplies, and 2. We put John in a disposable diaper at night. Thankfully, we have not had the problem again since the disposable keeps his skin dry at night. Fitting - The one-sized Fuzzi Bunz diapers grows by adjusting the elastic in the legs and back. This system has worked well and the diapers have really grown with John. He is 2 years and 4 months old now and the diapers still fit! Quality? - I still think the Fuzzi Bunz diapers are high quality. No, they are not white anymore and they've seen better days. But, since I've only had 8 diapers, these diapers have been through a lot of washing and wear. I use to have 9 diapers, but the PUL on one of the diapers started to separate, so I had to take it out of the rotation. I think this happened because I started drying the diapers in the dryer instead of air drying them - to speed up the process. Now I make sure to air dry them to prolong the life of the diapers. The Verdict - I am very happy with Fuzzi Bunz and we just got more for Baby #2! My friends threw a shower for me a couple of weeks ago and they gave me a set of diapers! I requested a set of 12 so that I could have more in my rotation. It will be especially nice when John is potty trained and I can use all the diapers for Brother. So when John is out of diapers I will have 20 diapers to use for one child (a dream come true!). New diaper lining - it's like a cloud! We went to the Kitsap Fair two weeks ago. John loved seeing all the animals, but most of all - he loved the rides! Andrew took him on three rides and John was hooked! He also ate cotton candy for the first time. I'm not sure if he liked it, but he did eat it! The fair holds a special place in my heart because I did 4-H when I was a child. Sewing, square dancing, and cats were my focus. For a few years, we camped at the fair the whole week, since we had to be there everyday anyway. This day trip to the fair brought back a lot of memories for me and I hope the fair will be a special event for our children too.